Google Transliteration is a handy online tool to write in different Indian languages. After Bengali, Gujarati, Marathi & Nepali – Google Transliteration has added support for 2 new languages: Punjabi and Urdu. Now you can type in either language by first typing word(s) in English, which are later converted into selected language. For example: type duniya in English and hit the spacebar key – you will get word duniya in Punjabi or Urdu (as per language selection) in the online text editor. After you are done with typing, copy the whole text as in native Indian language and paste in email, blog, website etc. 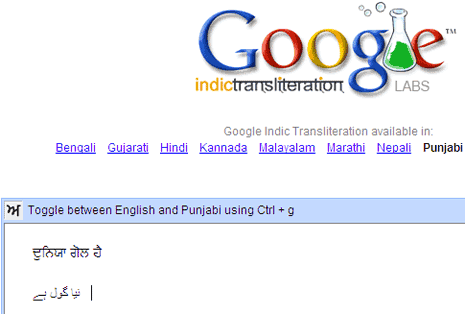 Head over to Google Transliteration to type in Punjabi, Urdu and other Indian languages with super ease! How to say 'I Love You' in different languages ? i wants to learn hindi bcz i have many friends who are indian but i can’t read or write hindi. so,have some one who helps me ?